1. Order a certificate from a Certificate Authority. 2. Once the certificate is installed, open up the Server's Binding dialog and add the HTTPS protocol binding, pick the obtained certificate from the combo box. 4. Optional. Create an URL rewrite rule which redirects HTTP requests to HTTPS ones. Let's Encrypt provides free Domain Validation (DV) certificates. However, some web-hosts don't support installing them. while purchasing you can purchase a standard certificate and wildcard certificate. Standard certificate you can use only for that particular host. wildcard certificate you can use for any host under your domain. Cost of wild card certificate will be costly. or otherwise, you can go for let's encrypt which provides SSL certificate for 90 days and automatically get renewed before expiry date using task scheduler in the windows server. Currently, let's encrypt doesn't provide wildcard certificate. 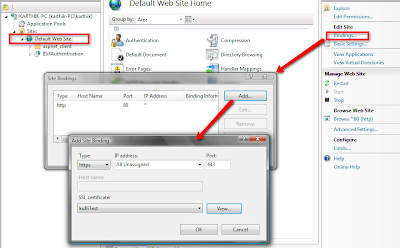 step2: Once you purchased or bought the SSL certificate you can configure IIS web server for https.. Please find the link below for the configuration. step2: Open 443 port in the firewall.